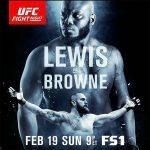 "UFC Fight Night 105: Lewis vs. Browne" takes place Sunday inside Scotiabank Centre in Halifax, Nova Scotia, Canada. UFC Fight Pass streams the first preliminary bout live starting at 6:30PM ET/3:30 PM PT. "Bellator 172: Fedor vs. Mitrione" goes down Saturday night inside SAP Center in San Jose, California. Stream the preliminary bouts live right here on 5thRound.com starting at 7PM ET/4PM PT. 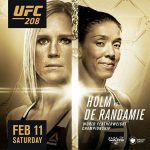 "UFC 208: Holm vs. De Randamie" takes place Saturday night inside Barclays Center in Brooklyn, New York. UFC Fight Pass streams the first two preliminary bouts live starting at 7PM ET/4PM PT. 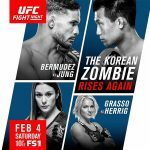 "UFC Fight Night 104: Korean Zombie vs. Bermudez" goes down Saturday night inside Toyota Center in Houston, Texas. UFC Fight Pass streams the first two preliminary bouts live starting at 7PM ET/4PM PT. 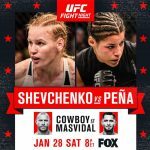 "UFC on FOX 23: Shevchenko vs. Pena" goes down Saturday night inside Pepsi Center in Denver, Colorado. UFC Fight Pass streams the first two preliminary bouts live starting at 4PM ET/1PM PT. 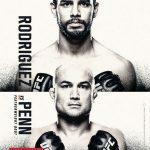 "UFC Fight Night 103: Rodriguez vs. Penn" takes place Sunday night inside Talking Stick Resort Arena in Phoenix, Arizona. UFC Fight Pass streams the first four preliminary bouts live starting at 6:15PM ET/3:15PM PT. She back! 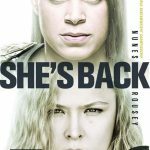 "UFC 207: Nunes vs. Rousey" goes down Friday night inside T-Mobile Arena in Las Vegas. UFC Fight Pass streams the first preliminary bout live starting at 7:30PM ET/4:30PM PT. "UFC on FOX 22: VanZant vs. Waterson" goes down Saturday night inside Golden 1 Center in Sacramento, California. UFC Fight Pass streams the first three fights live starting at 3:30PM ET/12:30PM PT. "UFC 206: Holloway vs. Pettis" takes place Saturday night inside Air Canada Centre in Toronto, Ontario, Canada. UFC Fight Pass streams the first three preliminary bouts live starting at 6:30PM ET/3:30PM PT.